The Bats’ Cave Temple of Tua Peh Kong was built at the foot of Penang Hill, at Jalan Pokok Ceri more than two hundred years ago. The temple is famous and unique because a few thousand bats make their dwelling place isn the cave situated inside the Temple. They fly out to find food which is mainly on insects at night and sleep by hanging themselves during the day. As you enter the Temple, you will see the magnificent statue of Tua Peh Kong (God of Prosperity) made of granite measuring 2 meter high. 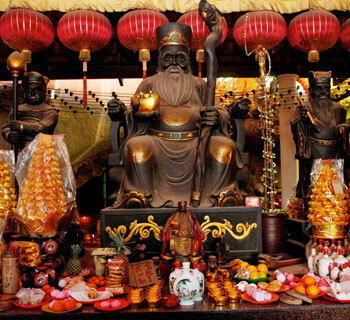 The Temple is the significant place of tourists as Tua Peh Kong is regarded as the patron saint of prosperities and good luck. © Copyright Bats' Cave Temple of Tua Peh Kong. All Rights Reserved.